The embrace, by working Americans, of policies that hurt their own interests can be understood on the basis of Ferenczi’s model of identification with the aggressor. Intrafamilial child abuse is often followed by the abuser’s denial. Children typically comply with abuse, in behavior and by embracing the abuser’s false reality, under threat of emotional abandonment. Similarly in the sociopolitical sphere, increasing threats of cultural and economic dispossession have pressed working Americans to adopt an ideology that misrepresents reality and justifies their oppression. In society as in the family, there can be a compensatory narcissistic reaction to forfeiting one’s rights that, ironically, encourages feelings of power and specialness while facilitating submission. Recent years have seen a resurgence of right-wing politics in the US, most dramatically in the sudden appearance of the reactionary, anti-tax, anti-social-safety-net Tea Party in early 2009, and the tremendous influence of celebrity demagogues like Rush Limbaugh, Glenn Beck, and Sarah Palin. In February 2012, The New York Times profiled a typical adherent of this movement. At the time, Ki Gulbranson was a 57-year-old shop owner from Lindstrom, Minnesota, with an annual income of about $39,000—meaning he was struggling to pay for necessities. He received a credit from the federal government, reducing by several thousand dollars the income taxes he had to pay; his children got breakfast and lunch in school, paid for by the government; and his mother had had two hip surgeries, courtesy of Medicare, the government’s single-payer national health insurance plan for the elderly. Yet Mr. Gulbranson worked for a Tea Party candidate in his local congressional election, supported politicians who promised to cut government spending and, according to the Times article, “wants you to know that he does not need any help from the federal government” (Appelbaum and Gebeloff, 2012). How can we understand the self-defeating passion among working Americans like Mr. Gulbranson, especially in recent years, for right-wing politicians and policies that, in reality, would help only the very richest and hurt the rest of us? I will examine this phenomenon through the lens of psychoanalytic trauma theory, with an emphasis on the contributions of Sándor Ferenczi. My long-standing interest in Ferenczi’s work, particularly his conception of the traumatic reaction he called “identification with the aggressor” (hereafter IWA—Ferenczi, 1933; Frankel, 2002a)—related to, but different from, Anna Freud’s (1936) later, better-known use of this term1—alerted me to striking similarities between a child’s response to abuse by her parents and the populist mania I am addressing. Ferenczi (1933) was surprised to discover in his adult patients who had survived extreme familial child abuse that, in their childhoods, rather than responding to mistreatment the way we might expect—with “reaction, hatred, disgust and energetic refusal”—they would “subordinate themselves like automata to the will of the aggressor, to divine each one of his desires and to gratify these … completely oblivious of themselves…” (p. 162, italics in original). Abused children comply to this extreme degree both to survive the encounter with an out-of-control adult who has absolute power over them, and to cling to a feeling of belonging to their family when the family has turned its back on them. These children not only do in behavior what the attacker wants, but also accommodate mentally, perceiving, thinking, and even feeling what they sense the aggressor wants them to. They instinctively grasp that playing the required role flawlessly means their inner experience must match their outer behavior. They both dissociate certain feelings, thoughts, and perceptions, and create others, as the situation demands (Frankel, 2012). The capacity for independent thinking may itself be a necessary sacrifice if the child is to accept the family’s definition of reality. Abused children often feel that being mistreated is somehow their own fault, a result of some shameful personal defect, punishment they deserve for a transgression, or that they somehow invited it—a kind of moral accommodation (Frankel, 2015), and a corruption of the child’s sense of right and wrong in which her feelings of self-criticism, guilt, and responsibility are cut loose from her actions and run rampant. Unconsciously, a child senses that taking on the blame that rightly belongs to the aggressor is the price she must pay to stay in the aggressor’s good graces (Ferenczi, 1933, p. 162). Feeling something is inherently wrong with herself also makes an abused child doubt she is qualified to judge events independently—to see her torment as a reaction to something someone else did to her, or that the event was really so terrible—easing the way for her to collude in exonerating her parents and accepting what they tell her. A child may still try to get rid of this painful, internalized blame by projecting it onto a scapegoat (but not the actual aggressor, if he is also someone the child needs), even as she cannot fully shake the sense of being bad herself. But what makes abuse traumatic—beyond a child’s ability to bear? Children who have been victimized will naturally seek comfort, perhaps from the non-abusive parent (Ferenczi, 1933; Balint, 1969). But when a parent says the abuse never happened, or that it was not so bad, she implicitly, and perhaps explicitly, blames the child for her own suffering. Through this parental hypocrisy, as Ferenczi (1933) thought of it, she completes the emotional abandonment of her already betrayed, already desperate child. Being left so profoundly alone at a time of extreme vulnerability is what is truly unbearable, “causing the psyche to crack” (Ferenczi, 1932, p. 193). The child, desperate to regain emotional contact with her parent, clings to the only slender reed of connection available by buying into the self-protective false reality her parent is selling. She doubts her own perceptions of reality, shuts down her own independent thoughts, and silences her disturbing feelings, on penalty of being cast out alone into the wilderness. The basic formula for synergy among the three broad forms of accommodation that are part of IWA is: I’ll do and be what you want me to; I’ll make myself think and feel the part; and I’ll feel that you’re being reasonable and good and blame myself for all the bad events and bad feelings—just don’t hurt me or abandon me (cf. Bach, 1994, p.17). When access to authentic perceptions, thoughts, and feelings is forbidden, one is cut off from a sense of one’s own needs and loses the ability to manage the distress that inevitably results. One can then make little real sense of disturbing feelings, which may come to feel like invaders. These may be precisely the consequences of IWA in the political sphere, as people mistake their own interests and cast about blindly, and only in wrong directions, for the causes of their unhappiness. Also important for what follows is that the IWA response is extremely widespread—as found clinically in many if not most high-functioning analytic patients who have not been victims of gross trauma (Frankel, 2002a); seen in extreme events like Stockholm syndrome, where hostages feel protective and even loving toward their captors; observed in broader social phenomena like the “escape from freedom,” the term Erich Fromm (1941) coined to describe many Germans’ eager compliance with their Nazi rulers; and in the social conformity in American society, based on anxieties about social exclusion, described by David Riesman et al (1950) as “other-directed man” and others since (e.g. Rushkoff, 1999). 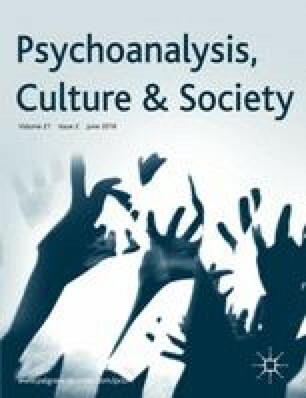 Social psychologists have documented what Ferenczi called IWA as a pervasive human response—most notably Stanley Milgram (1963), in his well-known “electric shock” studies of obedience, and Philip Zimbardo (Haney et al, 1973) in his “Stanford Prison Experiment,” where normal subjects randomly assigned to the role of guard or prisoner in a mock prison complied quickly and rather completely with role expectations—not only in their behavior, but also in attitudes and emotions. The apparent ubiquity of IWA may be due to the minor degree of at least occasional traumatic emotional abandonment in the histories of virtually everyone. Even a whiff of social exclusion could then function as a trigger for identification and compliance, much as Freud (1926) described in his theory of signal anxiety. The fact that humans are a species with a group survival strategy that relies on a high degree of social attunement and cooperation (e.g. Bigelow, 1972; Bouchard, 2009) suggests how dependent the smooth functioning of a complex society is on a continuous interplay of subtle social incentives—not least, threats of social exclusion. The implication, for our purposes, is that IWA can play a significant role in the social and political world. However, clinical observation also suggests that the explosion is often delayed or disguised, or misdirected toward substitutes for the real aggressor. The perpetrator is still needed by the dependent child, and the child protects her from his anger, often by idealizing her (Rothstein, 1977). And the explosion may be offset by a continuing urge to negate oneself, though this may be hidden, and expressed mainly through self-sabotage. This noisy attempt to reassert oneself—I’m speaking here of a persisting tendency in the aftermath of trauma, more prominent and compelling in some people than others—ties IWA to narcissistic pathology. Pathological narcissistic reactions can be understood as an inability to tolerate, and a refusal to accept, the annihilation of self that identifying with the aggressor entails or the emotional abandonment that provoked it (Kohut, 1971, 1972; Rothstein, 1977; Bach, 2006), both of which feel horribly shameful (Frankel, 2002b, 2015). These twin intolerable realities are denied by soothing omnipotent fantasies in which what feels lost has been restored—that one is whole, good, and loved—and more: that one is special—though this protest may be only half-believed. These omnipotent fantasies come with a sense of special entitlement to have the real people cast in one’s fantasy roles behave just as one wants; to coerce them to do this (Rothstein, 1977); and to express a righteous rage and inflict punishment when, inevitably, they fail to come through (see Kohut, 1972). An exaggerated sense of autonomy and power is essential to such fantasies, whether these qualities are attributed directly to oneself or—importantly for the sociopolitical manifestations of such narcissistic reactions—projected onto an idealized person or group with whom one identifies and whose perceived strength and righteousness one “borrows” (Kohut, 1971; Bach, 2006). This “manic” element (see Segal, 1964; Rosenfeld, 1987) reverses the awareness of one’s own needs and vulnerabilities—an awareness that would undercut the needed omnipotence. Feelings of badness are also projected onto a scapegoat, even as one may not fully shake the sense of being bad oneself (though some people glorify their own badness and take pride in it). The splitting, projection, instrumental (i.e. part-object) relationships, and rage I have been describing highlight the paranoid-schizoid structure of such fantasies (Klein, 1946). Omnipotent fantasies—based on a denial of the realities of trauma, other people, and oneself—are a poor strategy for rescuing a more straightforward relationship to one’s needs, salvaging a solid sense of goodness, and establishing a feeling of secure connection to others. These concepts move us beyond the answer that people vote for the interests they hope to have when they become rich, and deepen our understanding of why the “wedge issues” right-wing politicians exploit, which override economic self-interest by appealing to values or identity (e.g. Frank, 2004), manipulate voters so effectively. They allow us to spell out how emotions override rationality in politics (cf. Westen, 2007; Welch, 2008; Glynos, 2014), and more specifically to articulate the workings of manipulation through the politics of fear (e.g. Brzezinski, 2007; Westen, 2007)—to root the political fear response in psychoanalytic ideas about psychological trauma (cf. Layton, 2010; Salgó, 2013). I see a rather close correspondence between what happens in an abusive family and an unjust political/economic system, including many of the same elements: the nature of the trauma; the mechanisms of accommodation and compliance; and the role of exciting omnipotent fantasy, which facilitates compliance by hiding the pain that results from the loss of trust, of a secure connection with others, and of a sense of personal value and security rooted in that connection (see Mitscherlich and Mitscherlich, 1975; Salgó, 2013). Traumatic emotional abandonment can occur in societies as well as families—what sociologist Daniel Bell (1962), seeking half a century ago to explain the appeal of the radical right, called being dispossessed.4 In the US in recent years, many in the working- and middle- classes have felt this both economically and culturally.5 Income and wealth inequality have been growing in recent decades (Piketty, 2014). And, contrary to our national myth, people are likely to be stuck where they are—intergenerational income mobility in the US is lower than in most other developed countries (Surowiecki, 2014). The recent economic crisis has deepened an already existing economic dispossession arising from income and wealth inequality, lack of income mobility, and the lack of a strong social safety net in the US. Interestingly, it is the conservative southern states where the social-safety-net is generally weakest (Sauter et al, 2014) and there is least intergenerational income mobility (Pew Charitable Trusts, 2012), suggesting that those who have been most economically dispossessed are most likely to support a movement that runs directly counter to their economic interests. Growing ethnic and gender diversity, especially in social arenas that had been more homogeneous (United States Census, 2011)—indeed, the US is on track to become a “majority-minority” country, with non-Hispanic whites moving into the minority in just 30 years (United States Census, 2012)—has added a sense of cultural to economic dispossession among segments of the white population, a sense made more acute by the election of a Black president. In fact, the Tea Party was created in the immediate aftermath of what, for this group, can be thought of as the twin dispossessions of the Great Recession and President Obama’s election. Large-scale economic and cultural dispossessions map onto personal anxieties about survival and emotional abandonment that all of us share to greater or lesser degrees—the same fears that motivate IWA. Moreover, increased fears of a terrorist threat following the attacks of September 11th, 2001 have been repeatedly exploited by right-wing politicians (cf. Welch, 2008) and compounded many people’s sense of insecurity. How are working people coerced into embracing, or at least acquiescing in, their own dispossession? Ferenczi’s (1933) concept of parental hypocrisy in the family becomes, on the larger scale, ideology, in its original and I believe still very useful meaning (cf. Žižek, 1994): a dogma based on a false consciousness that systematically misrepresents reality, while reflecting and supporting existing power relations, and justifying the privilege of the powerful and the lack of it for everybody else, in order to keep the oppressed in line. As in an abusive family, aggression by the powerful against the rest is presented as beneficial to all—for instance, the position that taxes on the wealthy, regulations on corporations, and government spending on social insurance programs must all be kept low—and that these reactionary policies, which hurt everyone who is not rich, are good for everybody. People hurt by these policies are blamed for their own suffering, just like abused children—the unemployed, for instance, are told they must really not want a job (never mind that jobs have disappeared), and that a social-safety-net would undermine their motivation to find one. This ideology—the “magic” of unfettered markets as a panacea for all of society’s problems (see Giroux, 2014, pp. 76–77)—is presented as natural law or absolute truth, and its questioning seen as a sacrilege and an outrage. In society as in the family, the victims’ defensive reaction to this devastating one-two punch—dispossession, then disavowal of the aggression, portraying it as beneficial—is often one of enthusiastic compliance and passionate identification with the oppressor’s ideology. Why do the victims sign on? Like exploited children, oppressed people, desperate to belong and feel secure, often buy into the omnipotent fantasy being sold to them, where wishes overpower reality (Freud, 1921; Mitscherlich and Mitscherlich, 1975; Layton, 2010; Salgó, 2013; Glynos, 2014). The fantasy—of belonging to a special group—provides a feeling of specialness that blocks and replaces insecurities and despair, and helps people feel they are affirming their personal value and self-determination. In fact, however, the fantasy reflects and supports the ideology, expediting people’s submission to exploitation and the relinquishing of their rights and interests. Indeed, blinding oneself to one’s own real interests is a precondition for acceptability in this fantasy community (Mitscherlich and Mitscherlich, 1975; Salgó, 2013). The omnipotent fantasy typically has several aspects. It offers a charismatic rescuer to idealize and identify with—perhaps an attractive politician or magnetic media figure acting as a front for those with real power, like the Koch brothers, who stay in the shadows (Mayer, 2010). Community organizer Saul Alinsky warned in 1972 that the middle class’s “fears and their frustrations over their impotence can turn into political paranoia … driving them to the right, making them ripe for the plucking by some guy on horseback promising a return to the vanished verities of yesterday” (The Progress Report, 2009). Paranoid and manic attitudes, inherent in omnipotent fantasies, are key to easing the way to complying with an aggressor. Paranoia diverts rage and resistance toward false enemies like government (Alford, 2014; Rustin, 2014)—denounced as robbing people through taxes and oppressing them with needless regulations—while masking the corporate theft of their rights. It also deflects personal feelings of insecurity, weakness, contemptibility, and badness onto scapegoats like minorities and other relatively powerless members of society (see Layton, 2010, 2014; Alford, 2014)—the so-called “undeserving poor”—helping people escape the uneasy feelings that might undermine their happy identification with their oppressors. Paranoia further disqualifies as bad or alien any outside influence that contradicts the fantasy—liberal voices that might inspire questioning and dissent, for instance. Indeed, the historian Richard Hofstadter (1964), during Barry Goldwater’s 1964 conservative candidacy for president, wrote about a recurring paranoid element in right-wing American politics. The manic urgency (manic as a psychological defense, not a psychiatric diagnosis) to always feel good, and disavow all need, vulnerability, and self-doubt, similarly erases bad feelings that could awaken resistance (Peltz, 2005; Layton, 2010). Importantly, it also does not tolerate the tension inherent in critical thinking. The manic element dovetails with paranoia by bestowing a feeling of specialness on those inside the tent, while (at least implicitly) threatening disdain, exclusion, and (at least symbolic) aggression toward anyone who might be thinking of leaving it. These out-groups, along with Big Government itself, are accused of undermining the traditional values and culture of so-called “Real Americans” (i.e. white, Anglo-Saxon, Christian, heterosexual, dependency-disdaining Americans). Disparaged marginal groups become recipients of right-wingers’ disavowed and projected feelings of vulnerability, insecurity, need, and envy (cf. Alford, 2014; Layton, 2014; Rustin, 2014)—feelings that, in reality, are often intensified by corporate actions. They are depicted as the moral opposite of strong, self-reliant “Real Americans” who shun government “handouts,” don’t want a “nanny state,” and don’t whine. Autonomy—the emotion-laden words in American mythology are freedom, liberty, independence—is here the glorified value, and a key, manic element of the underlying, ideology-based, omnipotent fantasy. The insistence on feeling completely independent, denying even the interdependence integral to living in a society (Alford, 2014; Layton, 2014; Rustin, 2014), can be seen in the right’s responses to then Massachusetts Senate candidate Elizabeth Warren’s eloquent description of how all members of society inherently rely on each other and thus have responsibility to each other. Texas congressman and sometime Republican presidential hopeful Ron Paul, for instance, vilified Warren as a “socialist” (Johnson, 2011). When President Obama later echoed Warren’s message (Gabriel and Baker, 2012), he was branded with the same curse and advised by former New Hampshire governor John Sununu to “learn how to be an American” (Rosenthal, 2012). Paul supplied an even more extreme example of fetishizing autonomy despite the consequences. During Hurricane Irene, in the summer of 2011, he spoke longingly of the days before federal disaster aid, when people took care of such matters themselves. He described the Federal Emergency Management Agency, the government’s disaster preparedness and response agency, as “a great contribution to deficit financing” and said “we should be like 1900”—the year the deadliest hurricane in US history hit Galveston, in Paul’s own congressional district, and killed 8,000 people (which he did not mention) (Benen, 2011). The false sense of self-sufficiency and security that feeling like a Real American confers is bolstered by our culture’s manically tinged iconography of power and aggression—crowds chanting “USA! USA!” and “Drill, baby, drill!”; advertising images of pickup trucks mastering the toughest terrain; hit after ferocious hit by muscle-bound, armor-clad football players; the fetishizing of unrestricted, unregulated gun ownership as essential to liberty (Bandow, 2013); and anti-tax fanatic Grover Norquist’s wish to shrink government “down to the size where we can drown it in the bathtub” (Edsall, 2012). “Stand your ground” laws epitomize the aggressive sovereignty of the individual revered by the right. The idolization of strength is also evident when right-wingers on the warpath against government spending and deficits holster their weapons when it comes to cutting funds for the military. Strength is the virtue that annuls all sins. In contrast, weakness, or anything that could be mistaken for it, is unforgivable. The narcissistic emphasis on power and aggression, and rejection of vulnerability, are also seen in the right’s attraction to mean-spirited policies and bullying politicians. Crucially, considering oneself a Real American also provides a sense of belonging that compensates for, and hides, disavowed feelings of dispossession and abandonment. (In fact, fetishizing “independence” may transform feelings of abandonment from bad to good.) The sense of internal exile felt by people in danger of losing jobs, homes, and culture is replaced with a hypercharged sense of belonging (cf. Layton, 2014), perhaps especially for those who identify with a special subgroup of Real Americans (e.g. the military, the Tea Party, gun owners) that fancies itself a sterling embodiment of the American autonomy myth. Drinking this ideological kool-aid is also promoted by influential right-wingers actively encouraging mental accommodation in its various forms—promoting self-deluding stratagems that much of an insecure citizenry has been only too eager to adopt. For instance, as in an abusive family, evidence contrary to the approved view of reality is annulled. We see this clearly in several areas, such as the right’s denial of man-made climate change, evolution, and the growing body of economic evidence about the worldwide failure of austerity policies during the recession. In regard to climate change, for example, McCright and Dunlap (2011) systematically examined public opinion data on climate change over the first decade of the current century and found that “conservative white males are significantly more likely than are other Americans to endorse denialist views.” James Inhofe, Republican US Senator from Oklahoma and former Chairman of the US Senate Committee on Environment and Public Works—who, incidentally, has received nearly two million dollars in political contributions from the coal and oil industries (Oil Change International, 2014)—famously declared that “global warming is the greatest hoax that has been perpetrated” (Johnson, 2010). Meanwhile “[a] new law in North Carolina will ban the state from basing coastal policies on the latest scientific predictions of how much the sea level will rise” (ABC News, 2012). Religion is sometimes enlisted as an ally against scientific evidence, in the service of the pro-business ideology and its benefactors—in the case of climate change, the fossil fuel industry. John Shimkus, Republican congressman from Illinois, while campaigning for chairmanship of the House Energy and Commerce committee (and currently chair of its subcommittee on Environment and the Economy), cited the biblical book of Matthew, saying: “The earth will end only when God declares it’s time to be over. Man will not destroy this earth. This earth will not be destroyed by a flood. … I believe that’s the infallible word of God, and that’s the way it’s going to be for his creation” (Rudolf, 2010). Since he believes that man-made climate change will not destroy the earth, Shimkus said that, if he were elected chair, committee action on climate change would end. Republicans have even pushed to prevent the collection of evidence about vital policy matters such as climate change, the effects of gun violence, and the likely economic effects of lowering tax rates on the wealthy, while trying to defund social science, economics, and even some hard science research (e.g. Kaiser, 2012; Lacey, 2012; M.S., 2013, Stratford, 2014). They are, in other words, trying to block acquisition of any evidence that would contradict their ideology and the short-term economic interests of their powerful patrons. In a closely related thrust, independent thinking is devalued and deactivated in favor of loyalty, conformity, and obedience to authority (see Rustin, 2014)—the ever-present top values of the right (see Robin, 2012)—under threat of social exclusion. Krugman (2013) has observed that any conservatives who break with the right’s rejection of scientific consensus on any number of issues, starting with man-made climate change, “are then immediately branded as ‘no longer conservatives’ … there remains essentially no room for independent thinking within the conservative movement.” Dissent from conservative ideology is portrayed as un-American or even “treasonous”—the word governor of Texas and would-be presidential candidate Rick Perry used in 2011 to describe then Chairman of the Federal Reserve, Ben Bernanke, for Bernanke’s strategy to stimulate the nation’s struggling economy (McGreal, 2011). Media demagogue Rush Limbaugh’s followers proudly call themselves “dittoheads”—mindless repeaters of what is told to them. In 2012, the Texas Republican Party’s official position on education included the following statement: “We oppose the teaching of … critical thinking skills … which … have the purpose of challenging the student’s fixed beliefs and undermining parental authority” (Strauss, 2012). Indeed, thinkers per se are suspect—intellectuals disparaged as “pointy-headed,” living in an ivory tower, ignorant about real life. Robert Jay Lifton’s (1961) concept of the “thought-terminating cliché” refers to a simple, memorable, but false or oversimplified explanation, whose purpose and effect is to stop all independent thinking, eliminating any challenge to the authorities. The usefulness of this device in propagating the ideology’s core doctrines is exemplified in endless repetitions of such wild, but widely appealing, overgeneralizations as Ronald Reagan’s “Government is not the solution to our problem; government is the problem” (Weisman, 1981)—a refrain that, in many circles, simply ends discussion. Finally, Orwellian distortions of language obstruct the thinking of thoughts—and thus the taking of actions—contrary to the prescribed ideology (Orwell, 1948). The meaning of words is perverted, sometimes even into their opposites—Ferenczi’s “parental hypocrisy” writ large. Oppressive steps are taken in the name of defending freedom or liberty. For example, the Arizona legislature passed a bill (ultimately vetoed by that state’s governor) that would have allowed businesses to refuse to serve gay people, under the banner of “religious freedom” (Aljazeera America, 2014). Language is often used in bad faith by those who know better, or ought to. For instance, then Congressional Representative Michelle Bachmann characterized health-care reforms and moderate banking regulations as “the president’s agenda of socialism” (Wheaton, 2012). The new law expanding access to health care by requiring citizens to purchase health insurance from private insurers has been portrayed as a “government takeover of the health insurance industry” (Roy, 2013), while the law’s proposed end-of-life counseling has been labelled “death panels”—an appellation that earned the dubious distinction of “PolitiFact’s lie of the year” (Holan, 2009). Regulations safeguarding people’s health, safety, employment, and the environment have been criticized as burdening “job creators” (Lazof, 2012; Noon, 2014a), and opposing such regulations praised as defending “energy freedom” (Noon, 2014b) and “protecting jobs from government interference”—the latter, in fact, the title of a bill passed by the US House of Representatives (Education and the Workforce Committee, 2011). Half a century ago, Hannah Arendt (1963, pp. 85–86) talked about how the “language rules” used by those implementing Hitler’s “final solution” against the Jews facilitated their dissociation of feelings about their horrific task, allowing them to carry it out. Žižek’s (2012) conclusion that “[t]rue victory over your enemy occurs when they start to use your language, so that your ideas form the foundation of the entire field” concisely states the core of Lakoff’s (2011) concept of “intimidation via framing” and of Ikle’s notion of “semantic infiltration,” elaborated by Daniel Patrick Moynihan (Lind, 2013). Along with the encouragement of omnipotent fantasy, disallowing evidence and disabling thinking short-circuit people’s feelings about what is being done to them—feelings that could lead them to act against those who keep them down. The American fetish with guns—tragically increasingly in the news in recent times—has become an article of faith among right-wingers, bringing together many of these paranoid and manic, narcissistic elements, starting with the enthrallment by omnipotent fantasies of power, aggression, and autonomy. DeBrabander (2014) has called the gun “the premier mark of individual sovereignty. … [This is] what makes the gun rights movement especially intoxicating for millions of Americans.” Thrilling, power-packed fantasies override evidence of our actual vulnerabilities—for instance, the facts that guns dramatically increase the likelihood that crimes, violence, and suicide attempts will become lethal (Lambert, 2004; Harvard School of Public Health, 2014) and that “having a gun in the home was associated with an increased risk of firearm homicide and firearm suicide” (Dahlberg et al, 2004). Mindless, thought-terminating slogans bolster the rejection of rational consideration of such facts. Refrains like “guns don’t kill people; people kill people”, or “the only way to stop a bad guy with a gun is a good guy with a gun”—the National Rifle Association’s Executive Vice-President’s defiant response to the lethal shootings of twenty first-grade students and six school staff members in Newtown, Connecticut, in December, 2012 (Pilkington, 2012)—concoct all manner of enemies in the minds of some gun zealots, including a Big Government that, in a bizarre vision, will need to be fought off with all the firearms we can muster. These slogans also reinforce a feel-good fantasy identification as a Real American, rationalized by an individualist interpretation of the Second Amendment to the Constitution, and construed to assure the right of individuals to own any weapons they choose. When so many Americans resist limitations on possessing even military-style semi-automatic assault rifles with ammunition clips that can hold dozens of bullets, and oppose background checks on potential gun buyers (Volsky, 2013), omnipotent fantasies team up with unthinking compliance to trump reason and self-interest. Gun advocacy organizations like the National Rifle Association promote a seemingly grass-roots ideology that, in fact, supports a gun-manufacturing industry with which the Association has close financial ties (Stone and Hallman, 2013). The Tea Party is also an excellent example of the fusion of all these elements—embodying a populist omnipotent fantasy based on autonomy; brimming with excitement and a sense of power; with a paranoid “us-versus-them” focus on various enemies, of both the feared and contemptible varieties; rejecting contrary evidence and critical thinking in favor of angry, often mindless and even senseless slogans (“Keep your government hands off my Medicare” became notorious during the health-care reform debate—a slogan that was nonsense, since Medicare is a government program, yet its right-wing beneficiaries, who generally liked it, demanded the government stay out of it); and fronted by charismatic stand-ins like Beck, Limbaugh, and Palin, who are offered as exciting, idealized figures to identify with, as a route to feelings of security and belonging. And not least, its core activity is attacking social-safety-net programs whose existence bears witness to people’s vulnerabilities and needs, often including the needs of the protesters themselves, such as dependable access to health care and, for many—like Mr. Gulbranson, mentioned earlier—income assistance. Rejecting government spending on safety-net programs, and opposing government regulations and taxes that fall largely on corporations and the wealthy, amounts to doing the bidding of the ultra-rich, right-wing industrialists like the Koch brothers, who bankroll the purportedly grass-roots Tea Party movement (Mayer, 2010), the true aggressors. I hope I have given a sense of the value of the concept of IWA for understanding large-scale social phenomena—in this case, how the political attitudes that may be the most manifest and dramatic characteristics of right-wing populist extremism have their roots in exciting, omnipotent fantasies that both compensate for, and facilitate: (1) people’s (often eager) acceptance of an ideology that says they deserve less than other people; (2) the loss of a sense of belonging—a major motivator of IWA; and (3) the stifling of people’s sense of differentiation and self-awareness as political beings, resulting in their loss of a direct sense of their own real interests and their ability to pursue them in the political arena. All of these factors maximize compliance with people’s own subjugation—they maximize IWA. These narcissistic phenomena work synergistically with other forms of accommodating the aggressor, and ultimately have their roots in the threats of traumatic social exclusion that motivate IWA. On a broader scale I have attempted to demonstrate the political value of psychoanalytic thinking—how insights derived from the systematic clinical study of trauma and unconscious conflict can illuminate the ways people work against their own conscious intentions and actual interests, in the larger social sphere as well as in their personal lives, and actively collude in their own powerlessness. Ferenczi (1933) introduced the term in 1932 to describe processes involved in complying with an aggressor. Several years later, Anna Freud, in her 1936 classic, The Ego and the Mechanisms of Defense, used the term to indicate responding to helplessness in the face of aggression by becoming aggressive oneself toward a third party. Chernomas (2014) addresses this compensatory narcissistic reaction, correctly in my view, as an instance of identification with the aggressor in the sense that Anna Freud spoke about (see note 1). In fact, the economic downturn and political and cultural shifts bearing on a sense of dispossession—notably President Obama’s election and a concern with immigration into the US—were factors emphasized in an unclassified US government report exploring causes of rightwing extremism, titled “Rightwing Extremism: Current Economic and Political Climate Fueling Resurgence in Radicalization and Recruitment,” conducted by the Office of Intelligence and Analysis of the US Department of Homeland Security and published a few months after Obama became president (Department of Homeland Security, 2009). The report has since been removed from the DHS website following “blowback” from conservative groups and congressional representatives (Belew, 2014), but is still available elsewhere online. Recent articles by Alford (2014), Chernomas (2014), Layton (2010, 2014), and Rustin (2014) elaborate from different angles how neoliberal ideology and economic arrangements, basic to contemporary American society, create shame about basic human vulnerabilities and interdependencies (Layton, 2010, 2014), isolate people, and stir up anxieties about dispossession. ABC News, online (2012) New law in North Carolina bans latest scientific predictions of sea-level rise. http://abcnews.go.com/US/north-carolina-bans-latest-science-rising-sea-level/story?id=16913782, 2 August, accessed 28 June 2014. Aljazeera America (2014) Arizona gov. vetoes controversial ‘religious freedom’ bill. http://america.aljazeera.com/articles/2014/2/26/brewer-gay-law.html, 26 February, accessed 28 June 2014. Appelbaum, B. and Gebeloff, R. (2012) Even critics of safety net increasingly depend on it. http://www.nytimes.com/2012/02/12/us/even-critics-of-safety-net-increasingly-depend-on-it.html?pagewanted=all, 11 February, accessed 28 June 2014. Bandow, D. (2013) Gun rights and liberty go hand in hand. http://news.investors.com/ibd-editorials-perspective/022113-645258-gun-rights-and-liberty-go-hand-in-hand.htm?ntt=bandow%20gun%20liberty, 21 February, accessed 28 June 2014. Belew, K. (2014) Veterans and white supremacy. http://www.nytimes.com/2014/04/16/opinion/veterans-and-white-supremacy.html?hp&rref=opinion, 15 April, accessed 28 June 2014. Benen, S. (2011) Ron Paul rejects FEMA role in hurricane response. http://www.washingtonmonthly.com/political-animal/2011_08/ron_paul_rejects_fema_role_in031821.php, 26 August, accessed 28 June 2014. Berkowitz, R. (2013) Misreading “Eichmann in Jerusalem”. http://opinionator.blogs.nytimes.com/2013/07/07/misreading-hannah-arendts-eichmann-in-jerusalem/?_php=true&_type=blogs&_r=0, 7 July, accessed 28 June 2014. Brzezinski, Z. (2007) Terrorized by ‘war on terror’. http://www.washingtonpost.com/wp-dyn/content/article/2007/03/23/AR2007032301613.html, 25 March, accessed 28 June 2014. Carroll, A. (2012) New and improved Krugman chart. http://theincidentaleconomist.com/wordpress/new-and-improved-krugman-chart/, 13 February, accessed 28 June 2014. Cassidy, J. (2012) Obamacare supreme court case is a bad joke. http://www.newyorker.com/online/blogs/johncassidy/2012/03/supreme-court-case-is-a-very-bad-joke.html, 27 March, accessed 28 June 2014. Dahlberg, L.L., Ikeda, R.M. and Krasnow, M. (2004) Guns in the home and risk of a violent death in the home: Findings from a national study. American Journal of Epidemiology 160(10): 929-936, http://aje.oxfordjournals.org/content/160/10/929.full, accessed 28 June 2014. DeBrabander, F. (2014) Lock and load: The fatal error of the “stand your ground” philosophy. http://opinionator.blogs.nytimes.com/2014/02/23/locke-and-load-the-fatal-error-of-the-stand-your-ground-philosophy/?hp&rref=opinion, 23 February, accessed 28 June 2014. Department of Homeland Security (2009) Rightwing extremism: Current economic and political climate fueling resurgence in radicalization and recruitment. Report IA-0257-09, 7 April, http://www.fas.org/irp/eprint/rightwing.pdf, accessed 28 June 2014. Edsall, T.B. (2012) Debt splits the left. http://campaignstops.blogs.nytimes.com/2012/02/05/debt-splits-the-left/, 5 February, accessed 28 June 2014. Education and the Workforce Committee, US House of Representatives (2011) America’s job creators urge support for protecting jobs from government interference act. http://edworkforce.house.gov/news/documentsingle.aspx?DocumentID=260172, 15 September, accessed 28 June 2014. Gabriel, T. and Baker, P. (2012) Romney and Obama resume economic attacks, despite a few diversions. http://www.nytimes.com/2012/07/18/us/politics/romney-and-obama-resume-economic-attacks.html, 17 July, accessed 28 June 2014. Harvard School of Public Health (2014) Suicide. http://www.hsph.harvard.edu/hicrc/firearms-research/gun-ownership-and-use/, accessed 28 June 2014. Holan, A.D. (2009) PolitiFact’s lie of the year: “Death panels”. http://www.politifact.com/truth-o-meter/article/2009/dec/18/politifact-lie-year-death-panels/, 18 December, accessed 28 June 2014. Johnson, B. (2010) Colorado climate scientists tell Ken Buck: Global warming is not a hoax. http://thinkprogress.org/green/2010/10/24/174824/science-v-buck/, 24 October, accessed 28 June 2014. Johnson, L. (2011) Ron Paul on Elizabeth Warren: “She’s a socialist”. http://www.huffingtonpost.com/2011/11/08/elizabeth-warren-ron-paul-socialist_n_1081962.html, 8 November, accessed 28 June 2014. Kaiser, J. (2012) House bill targets health economics, evidence-based medicine. http://news.sciencemag.org/funding/2012/07/house-bill-targets-health-economics-evidence-based-medicine, 18 July, accessed 28 June 2014. Krugman, P. (2012) Moochers against welfare. http://www.nytimes.com/2012/02/17/opinion/krugman-moochers-against-welfare.html?_r=1&hp, 16 February, accessed 28 June 2014. Krugman, P. (2013) The closing of the conservative mind. http://krugman.blogs.nytimes.com/2013/05/25/the-closing-of-the-conservative-mind/, 25 May, accessed 28 June 2014. Lacey, S. (2012) Congressman says defunding climate science is a priority for GOP. http://thinkprogress.org/climate/2012/02/10/423052/congressman-says-defunding-climate-science-is-a-priority-for-gop/, 10 February, accessed 28 June 2014. Lakoff, G. (2011) The use of 9/11 to consolidate conservative power: Intimidation via framing. http://www.huffingtonpost.com/george-lakoff/the-use-of-911-to-consoli_b_955954.html, 10 September, accessed 28 June 2014. Lambert, C. (2004) Death by the barrel. http://harvardmagazine.com/2004/09/death-by-the-barrel.html, September-October, accessed 28 June 2014. Lazof, R. (2012) Washington should remove hurdles to job creation. http://www.usnews.com/opinion/blogs/economic-intelligence/2012/05/11/washington-should-remove-hurdles-to-job-creation, 11 May, accessed 28 June 2014. Lind, M. (2013) How right-wingers use semantic tricks to kill government. http://www.salon.com/2013/05/18/how_right_wingers_use_semantic_tricks_to_kill_government/, 18 May, accessed 28 June 2014. Lumet, S. (dir.) (1976) Network. United Artists, http://sfy.ru/sfy.html?script=network, accessed 28 June 2014. M.S. (2013) Ignorance is freedom. http://www.economist.com/blogs/democracyinamerica/2013/04/national-science-foundation-funding, 29 April, accessed 28 June 2014. Mayer, J. (2010) Covert operations: The billionaire brothers who are waging a war against Obama. http://www.newyorker.com/reporting/2010/08/30/100830fa_fact_mayer#ixzz2KWSxIpOs, 30 August, accessed 28 June 2014. McCright, A.M. and Dunlap, R.E. (2011) Cool dudes: The denial of climate change among conservative white males in the United States. Global Environmental Change, pp. 1163-1172. http://ezproxy.library.nyu.edu:2060/science/article/pii/S095937801100104X, October, accessed 28 June 2014. McGreal, C. (2011) Rick Perry attacks Ben Bernanke’s “treasonous” Federal reserve strategy. http://www.theguardian.com/world/2011/aug/16/rick-perry-ben-bernanke-treasonous, 16 August, accessed 28 June 2014. Noon, M. (2014a) Is this any way to treat the job creators?. http://finance.townhall.com/columnists/maritanoon/2014/01/19/is-this-any-way-to-treat-the-job-creators-n1781172/page/full, 19 January, accessed 28 June 2014. Noon, M. (2014b) Job creators sue federal government. http://finance.townhall.com/columnists/maritanoon/2014/03/23/job-creators-sue-federal-government-n1813160/page/full, 23 March, accessed 28 June 2014. Oil Change International (2014) Jim Inhofe (R-OK). http://dirtyenergymoney.com/view.php?searchvalue=inhofe&search=1&type=search#view=connections, 29 March, accessed 26 June 2015. Orwell, G. (1948) “The principles of newspeak”: An appendix to 1984. http://www.newspeakdictionary.com/ns-prin.html, accessed 28 June 2014. Pew Charitable Trusts (2012) Economic mobility of the states: Economic mobility project, Washington, D.C. http://www.pewstates.org/research/reports/economic-mobility-of-the-states-85899383564, accessed 28 June 2014. Pilkington, E. (2012) NRA chief breaks post-Newtown silence to call for armed guards at schools. http://www.theguardian.com/world/2012/dec/21/nra-newtown-armed-guards-schools, 21 December, accessed 26 June, 2015. Progress Report, The (2009) Interview with Saul Alinsky—Part 2: Empowering people, not elites. http://www.progress.org/tpr/interview-with-saul-alinsky-2/, accessed 28 June 2014. Robin, C. (2012) The conservative reaction. http://chronicle.com/article/The-Conservative-Mind/130199/, 8 January, accessed 28 June 2014. Rosenthal, A. (2012) How to be American. http://takingnote.blogs.nytimes.com/2012/07/17/how-to-be-american/, 17 July, accessed 28 June 2014. Roy, A. (2013) Government takeover: White House forces Obama care insurers to cover unpaid patients at a loss. http://www.forbes.com/sites/theapothecary/2013/12/14/government-takeover-white-house-forces-obamacare-insurers-to-cover-unpaid-patients-at-a-loss/, 14 December, accessed 28 June 2014. Rudolf, J.C. (2010) Climate skeptic seeks energy committee chairmanship. http://green.blogs.nytimes.com/2010/11/16/god-man-and-congress-on-climate-change/, 16 November, accessed 28 June 2014. Sauter, M.B., Hess, A.E.M. and Frohlich, T.C. (2014) States with the most (and least) government benefits. http://247wallst.com/special-report/2014/01/24/states-doling-out-the-best-and-worst-benefits/, 24 January, accessed 28 June 2014. Stone, P.H. and Hallman, B. (2013) NRA gun control crusade reflects firearms industry financial ties. http://www.huffingtonpost.com/2013/01/11/nra-gun-control-firearms-industry-ties_n_2434142.html, 23 January, accessed 28 June 2014. Stratford, M. (2014) Battle over NSF begins. http://www.insidehighered.com/news/2014/03/14/house-subcommittee-approves-bill-would-cut-nsf-social-science-research#sthash.nOMkv8bv.dpbs, 14 March, accessed 28 June 2014. Strauss, V. (2012) Texas GOP rejects ‘critical thinking’ skills. Really. http://www.washingtonpost.com/blogs/answer-sheet/post/texas-gop-rejects-critical-thinking-skills-really/2012/07/08/gJQAHNpFXW_blog.html, 9 July, accessed 28 June 2014. Surowiecki, J. (2014) The mobility myth. http://www.newyorker.com/talk/financial/2014/03/03/140303ta_talk_surowiecki, 3 March, accessed 28 June 2014. United States Census Bureau (2011) 2010 Census shows America’s diversity. http://www.census.gov/newsroom/releases/archives/2010_census/cb11-cn125.html, 24 March, accessed 28 June 2014. United States Census Bureau (2012) U.S. census bureau projections show a slower growing, older, more diverse nation a half century from now. http://www.census.gov/newsroom/releases/archives/population/cb12-243.html, 12 December, accessed 28 June 2014. Volsky, I. (2013) Senator offers pathetic reason for opposing background checks. http://thinkprogress.org/politics/2013/05/03/1958481/senator-offers-pathetic-reason-for-opposing-background-checks/, 3 May, accessed 28 June 2014. Weisman, S. (1981) Reagan takes oath as 40th president ….. http://www.nytimes.com/1981/01/21/us/reagan-takes-oath-40-th-president-promises-era-national-renewal-minutes-later-52.html, 20 January, accessed 28 June 2014. Wheaton, S. (2012) Bachmann says she will not continue in the race. The Caucus. http://thecaucus.blogs.nytimes.com/2012/01/04/bachmann-says-she-will-not-continue-in-the-race/, 4 January, accessed 28 June 2014. Žižek, S. (2012) Why Obama is more than Bush with a human face. rsn. http://readersupportednews.org/opinion2/277-75/14533-focus-why-obama-is-more-than-bush-with-a-human-face, 14 November, accessed 28 June 2014.